Designed for operation in rugged industrial processes, the compact FS10i Flow Switch/Monitor from Fluid Components International (FCI) now has obtained hazardous area approvals from multiple agencies for a wide range of liquid or gas monitoring applications that require accurate, reliable flow assurance and alarming. Ingress protection meets IP65, IP66, IP67 in non-hazardous locations; CE Marking, CRN, complies with Canadian Electrical code requirements of ANSI/ISA 12.27.01-2011 as a single seal device. It is also the only product in its class to carry a SIL 2 compliance rating per IEC 61508 and has a superior 90% Safe Failure Fraction (SFF). The FS10i Flow Switch/Monitor features an air/gas sensitivity and setpoint range from 0.076 to 122 MPS and for water or liquids from 0.01 to 0.5 FPS [0.003 to 0.15 MPS]. It is suitable for use in fluid temperatures from -40° to 212°C and at pressures up to 138 bar. Different than other devices, the FS10i Flow/Switch Monitor comes standard with both an SPDT 1A relay output for alarm/trip point setting instead of an open collector, and a 4-20 mA analogue output for trending and monitoring. Trip points can be set as high or low, and they can be adjusted with hysteresis and/or time delay settings and the 4-20mA output is rangeable by the user in the field installation. Designed for application versatility, the FS10i Flow Switch/Monitor is ideal for monitoring cooling water and fluids, leak detection, lubricant flow assurance, ventilation verification, chemical injection assurance, nitrogen purge verifications and compressor leak detection. Its compact size allows it to be placed in crowded equipment locations. The insertion style FS10i Flow Switch/Monitor is easy to install with a few simple tools. Set-up is done in the field using either the two-button keypad, or with a PC connection to the FS10i’s serial I/O port. The PC software for configuration and set-up is included at no extra charge. The instrument features a 10-character LED array to indicate actual flow range and trip point setting, changing flash rate to provide an immediate visual alarm indication to the user. For long service life, the FS10i Flow Switch/Monitor electronics are enclosed in a stainless steel body housing with aluminium end cap/top with polycarbonate overlay, which carries an IP66/IP67 rating. Input power is 24 Vdc (21.5 to 30 Vdc); 2.5 Watts maximum. 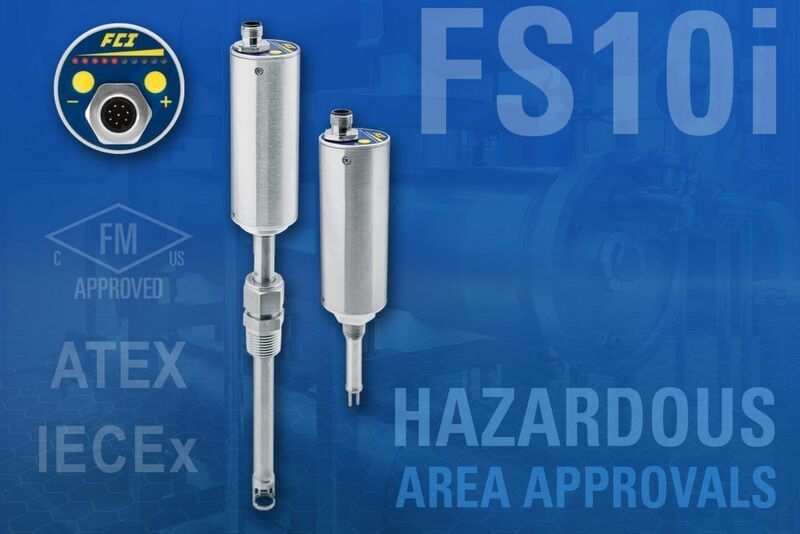 To ensure best performance and installation ease, the FS10i Flow Switch/Monitor is available in two probe lengths (insertion depth): a 50 mm length with a 0.25-inch NPT (M); and a 150 mm length, variable depth, with 0.5-inch NPT (M) compression fitting, with either a Teflon or metal ferrule. Electrical connections are to a standard M12 connector or, optionally, to 3m cable with pigtail terminations.